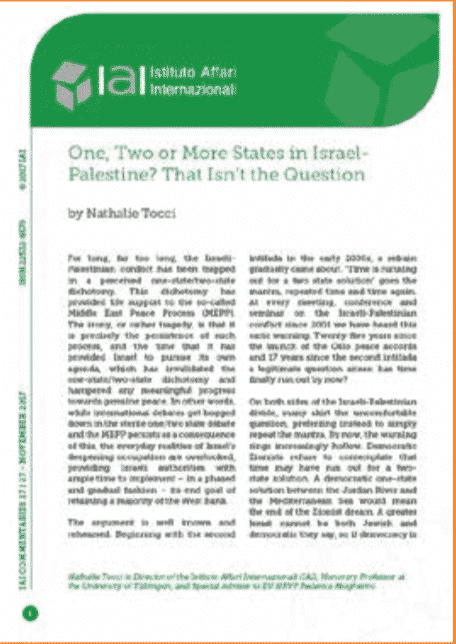 For a long time and for far too long a time, the Israeli-Palestinian conflict has been trapped in a perceived one-state/two-state dichotomy. This dichotomy has provided life support to the so-called Middle East Peace Process. The irony, or rather tragedy, is that it is precisely the persistence of such a process, and the time that it has provided Israel to pursue its own agenda, which has invalidated the one- state/two-state dichotomy and hampered any meaningful progress towards genuine peace.